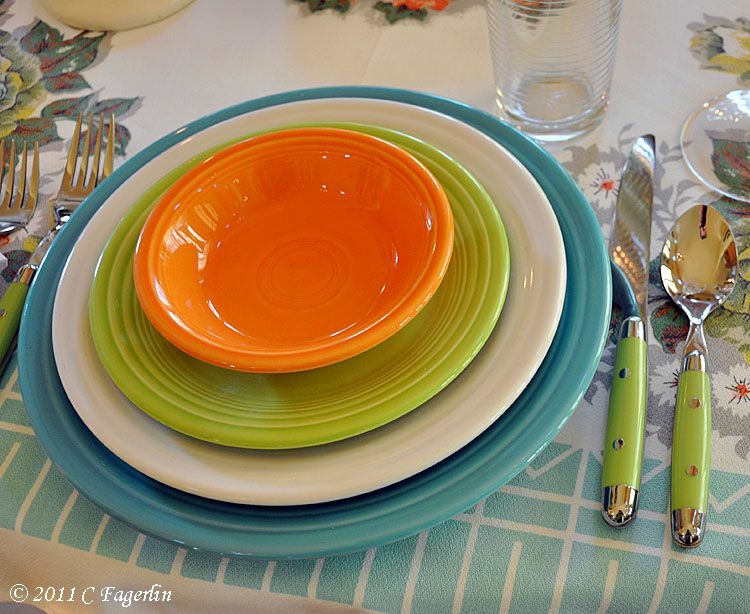 come join the fun and see many lovely tablescapes for Susan's weekly party. producing glorious blooms for 2011.
as a forecast of the wonderful colors of the return of Spring to the garden. Metlox Poppytrail Console Set included the Spiral candle holders and bowl. Napkin rings - Crate and Barrel decades ago! Thanks so much for coming by again this week to check out what's on my table! Makes me wish for summer! We have feet and feet of snow.....tired of it! want flowers! 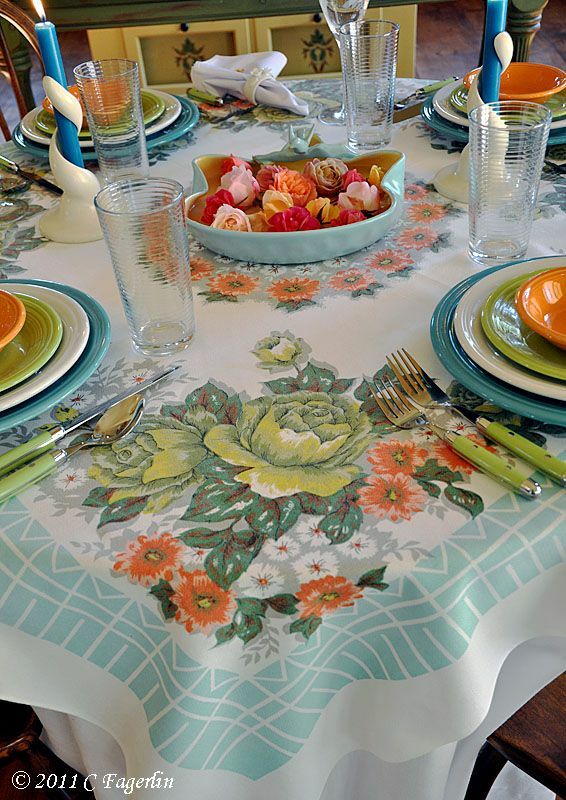 You have the prettiest tablecloths! I love the flowers floating in the center of the table. You certainly have me longing for spring! your tables are always amazing. Just amazing. You really know how to set a pretty table. Everything sight you shared is breathtaking. You Fiesta dishes look great. My mother had a full set years ago, but no longer do we have them. Wish we did. The turquois Fiesta is beautiful. And you console bowl is amazing. Looks perfect filled with the roses. Your fiesta table is just amazing! Gorgeous, as always! I love your candle holders so much ... I have never seen any like them before. Thanks for sharing! Love the spring colors. I love your fiesta! and your roses. wow. Such interesting candle holders! So curvy and cool! such pretty colors! Love your rose inspired table. Your roses are so beautiful and really tie the table together. 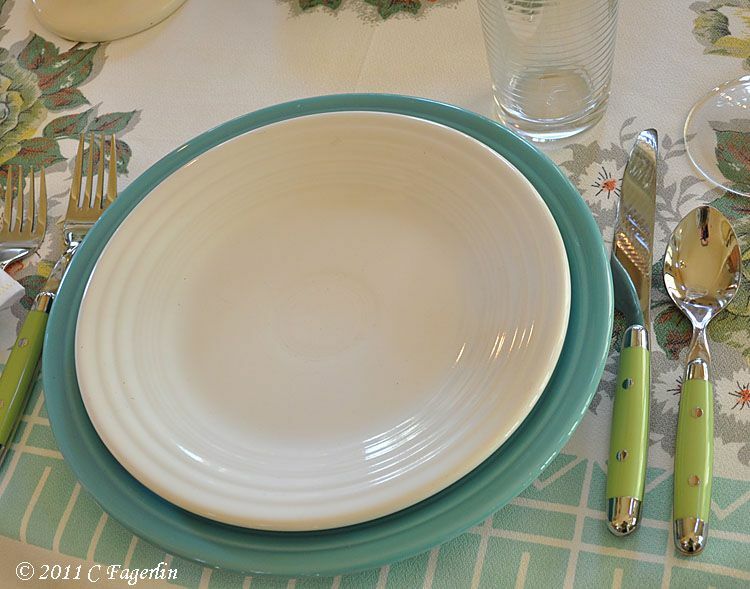 Excellent choice of dishes and accessories for this tablecloth! 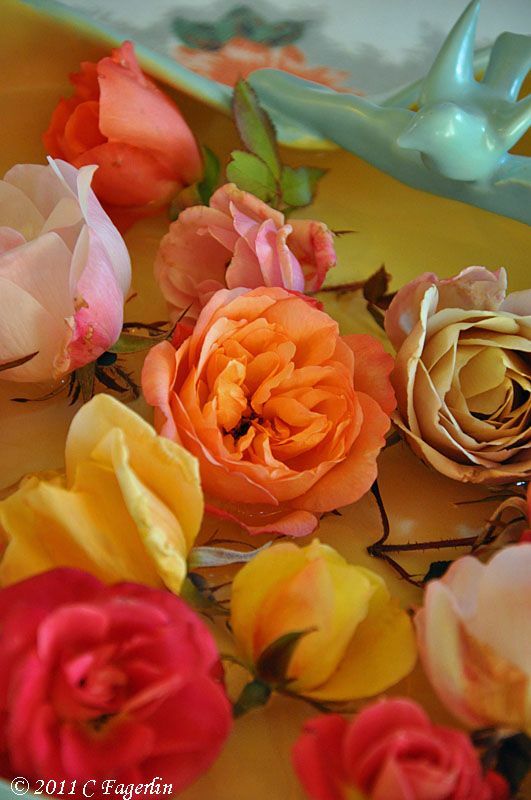 I am going to hire my son to prune my roses so they will look almost as beautiful on my table as yours do!!!! 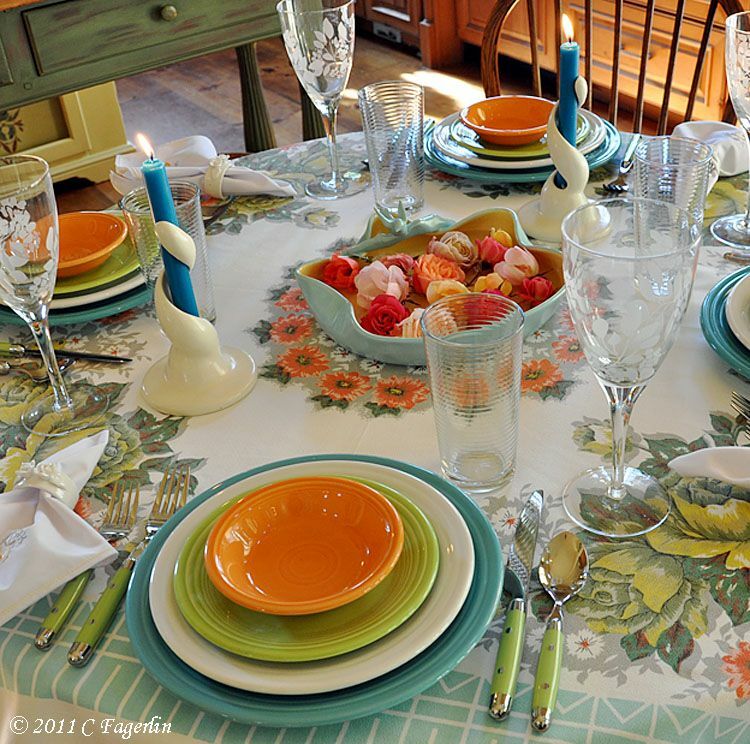 As always Candy, a beautiful tablescape! 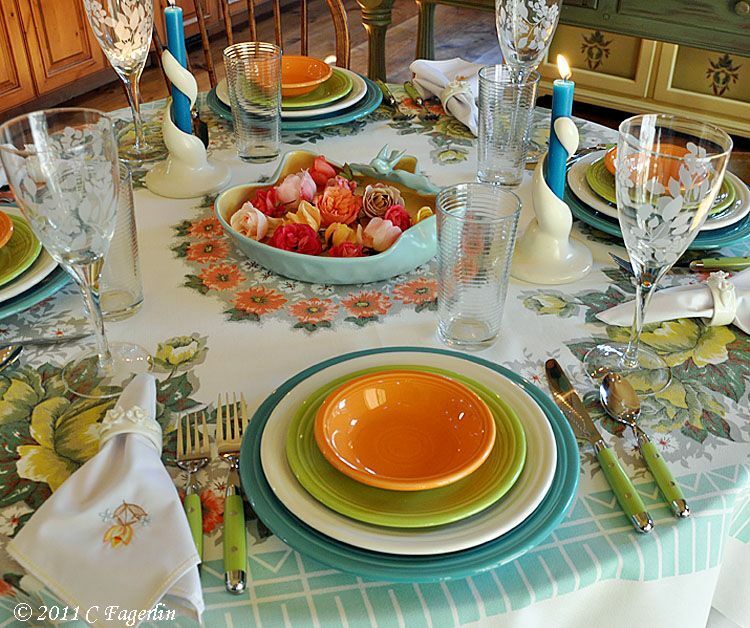 This tablescape makes me believe spring is just around the corner! What a beautiful combination of colors. Lucky you still having roses in January! 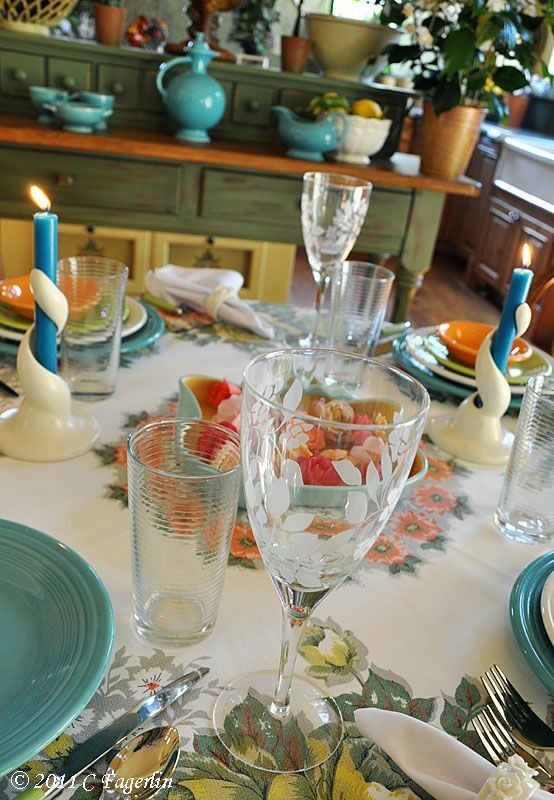 I LOVE your tablescape.....and the carafe is absolutely gorgeous!!!!! Beautiful post Candy! Your roses are gorgeous! 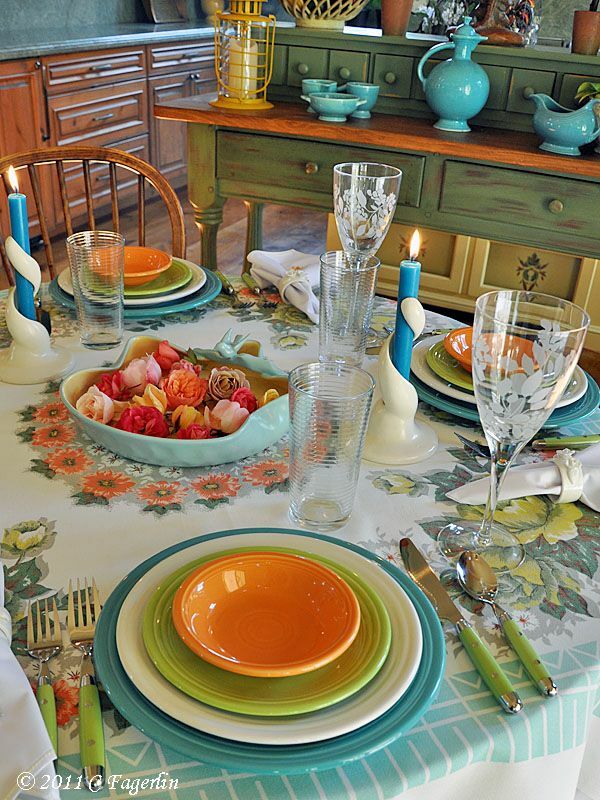 ooo, I am totally loving the centerpiece :) The color of the roses compliment the tableware so well. Simply gorgeous! 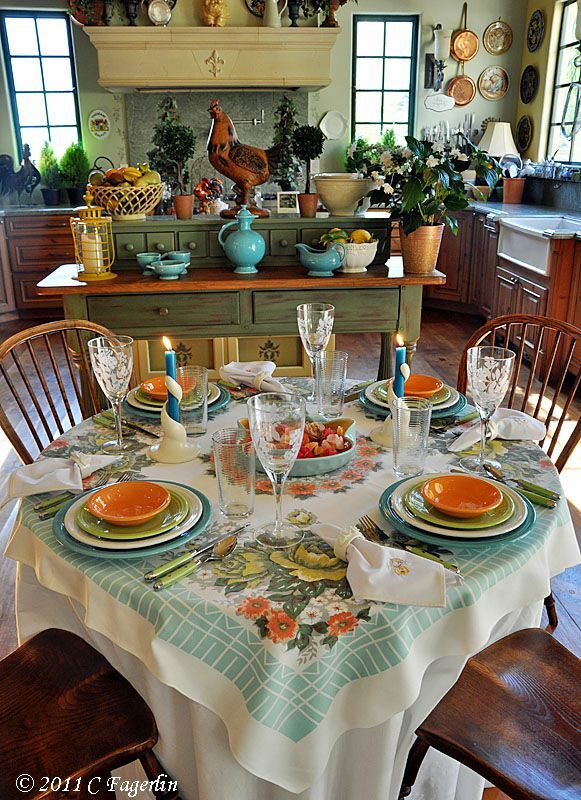 love the tablecloth and the bowl full of blooms is a great idea. . .boy, what I wouldn't give to have roses coming off my rose bushes.. .but we still have a long way until spring around here! My roses are buried under about 3 feet of snow, so I especially appreciate this reminder that they will indeed bloom again another day! 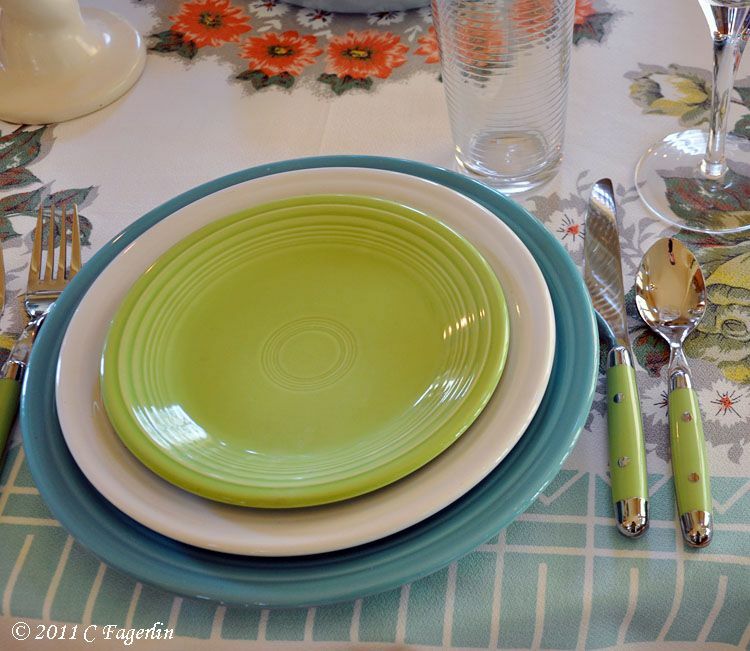 The combo of brights and neutrals on the table looks great, Candy! I think the Brimfield birdie is so happy to meet the other colors of the spirals. What a happy, sunny and cheerful table. Just what I needed to see on another gray January day!! you made a eye-candy with this table (as always!). 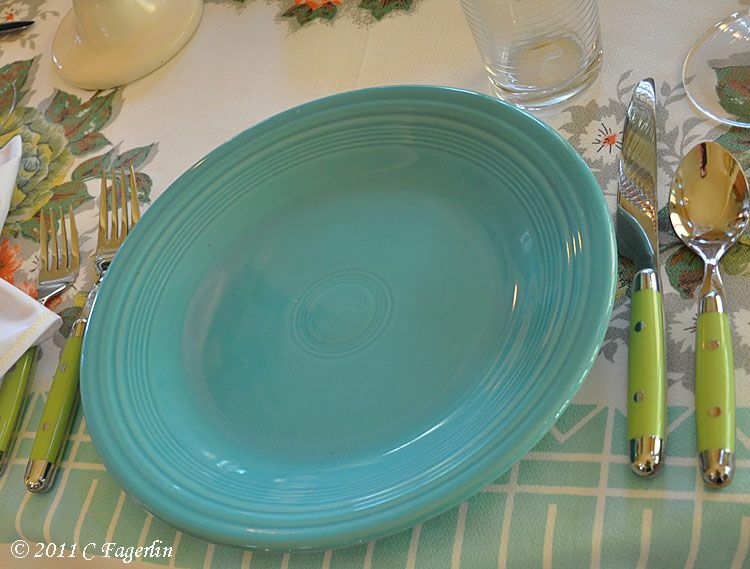 Love the turquoise color on the plates and the glasses are outstanding. All ist so summerly. I am, so tired of winter, I really enjoyed this look at your table. The color scheme here is wonderfully vintage and creative. What fun. What a beautiful color combination. 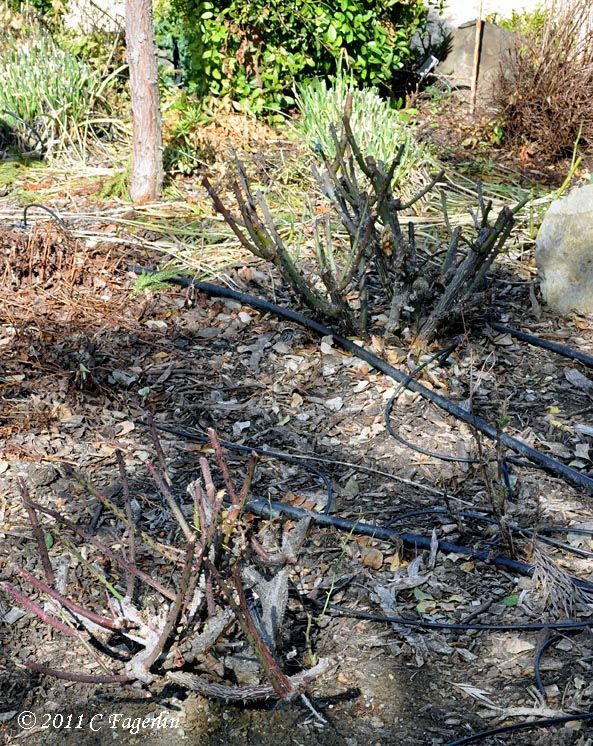 I always do that, too, when I cut the rose bushes back. I have shallow bowls of them all over the house. It's such a luxury being able to cut luscious boquets from them, isn't it? Thanks for a perfectly wonderful stop on our little journey through Alphabe-Thursday's letter "P"! Love the spring pick-me-up I got from your post. Absolutely beautiful and the photos are great. Can't wait for my roses to start coming on again. Blessings Candy. 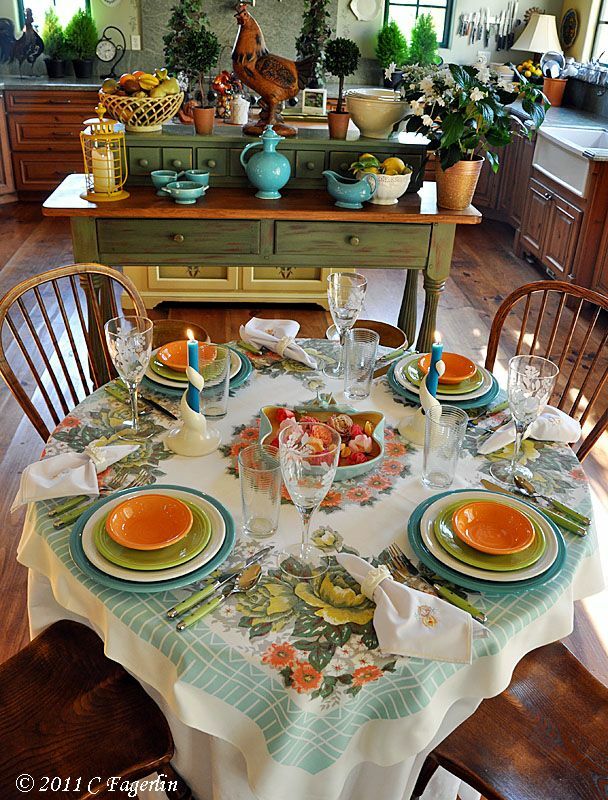 Beautiful table, I love the colors. 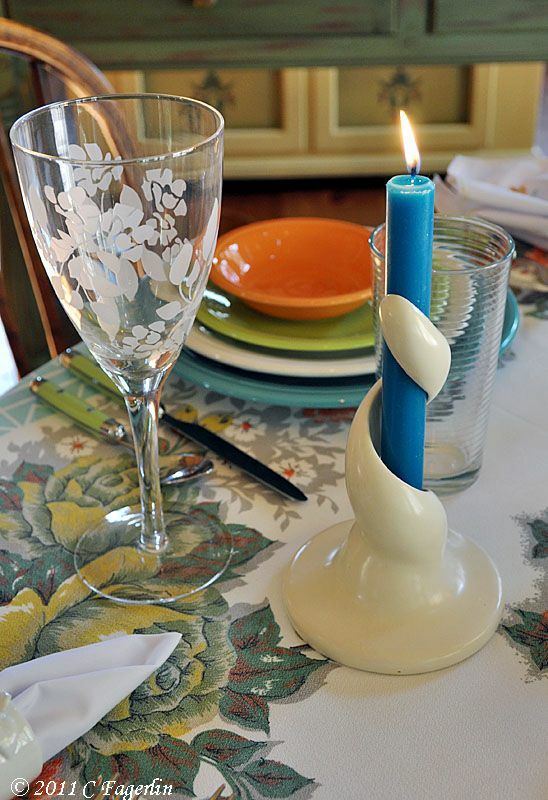 Those candle holders have to be my favorite!! Very unusual! Happy VTT! I'll be pruning my knockout roses soon. They look pretty sad at the moment. 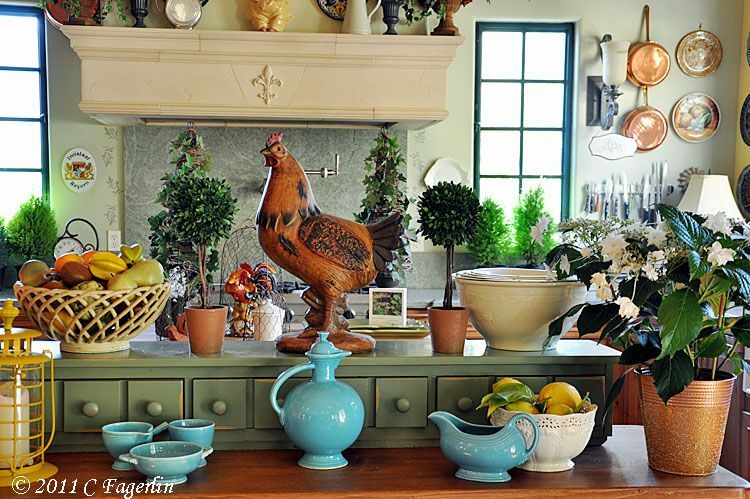 You have the prettiest kitchen! I linked over from Courtney's Feathered Nest Friday. Your table scape is amazing...every little detail is perfect. 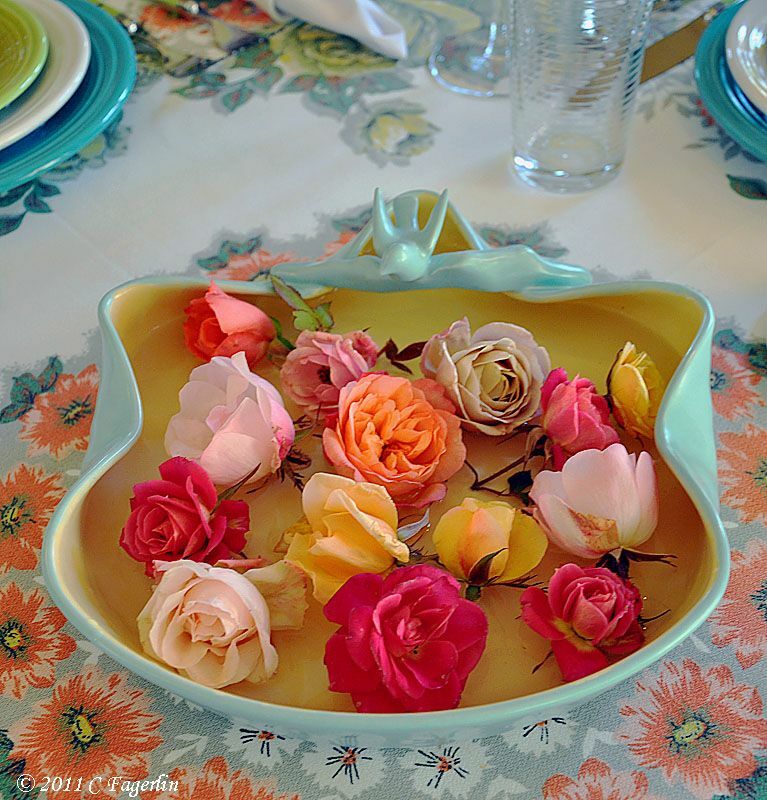 The little bowl with the bird on it and the roses in it are gorgeous. Thanks for such a lovely post! 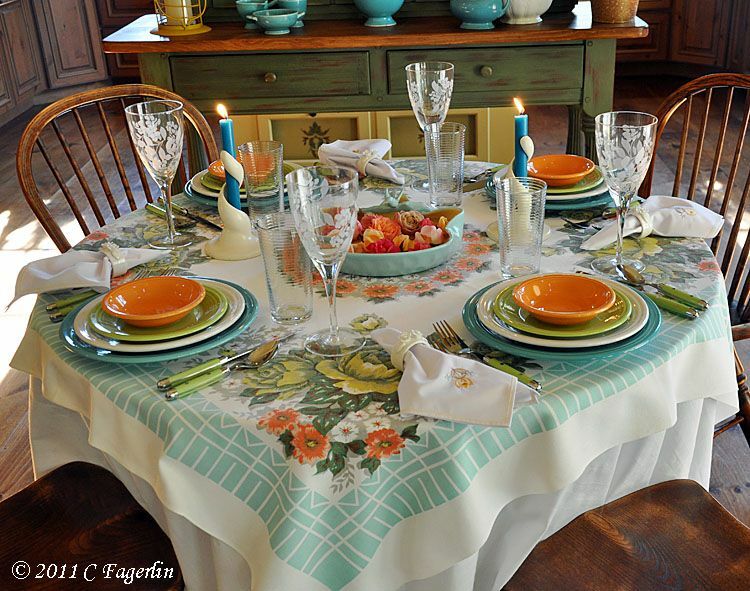 What a beautiful tablecloth! I love the colors. 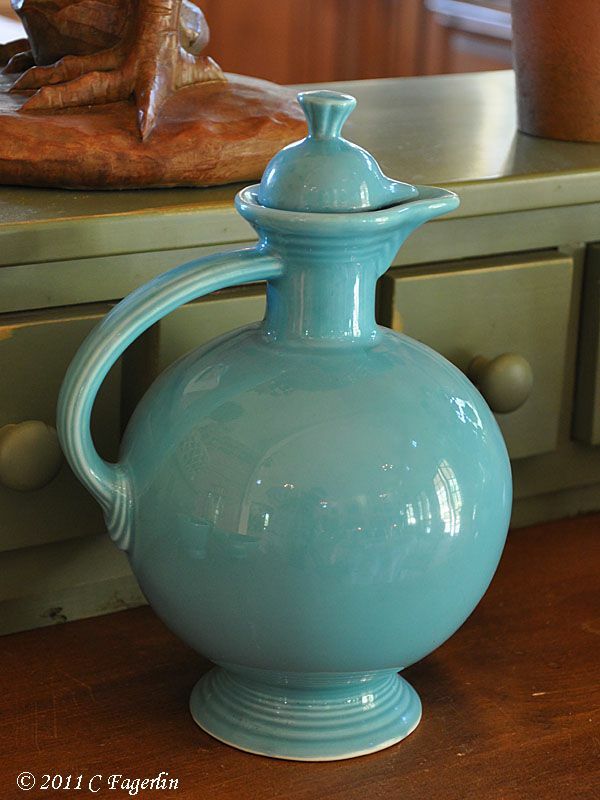 I am also having turquoise fiesta envy… and that console bowl – gorgeous! I love the pop of the tangerine. So that is where I got my napkin rings! Someone asked me about them a while ago and for the life of me, I could not remember where I had purchased them because I have had them so long. 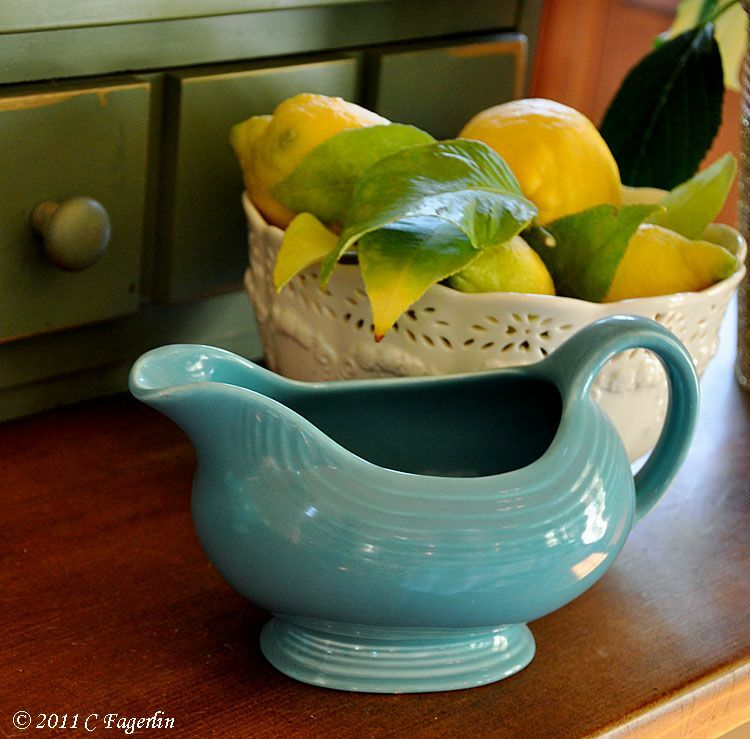 Love the carafe, such a wonderful shape. The little birdie on the bowl is adorable! 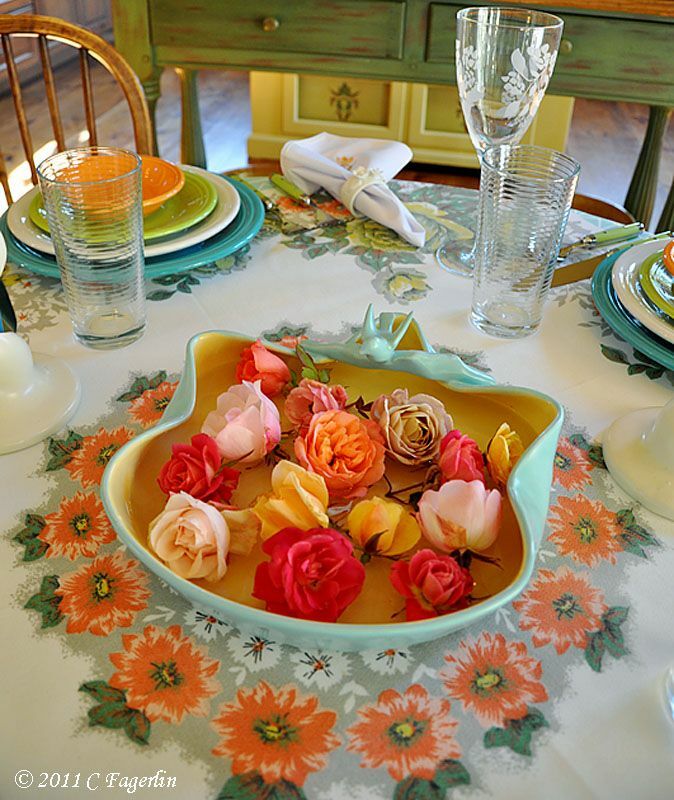 Just gorgeous dinnerware and so are the roses. Hard to believe you still have roses growing there. Love all the vintage color, so glad yo linked up with VIF! 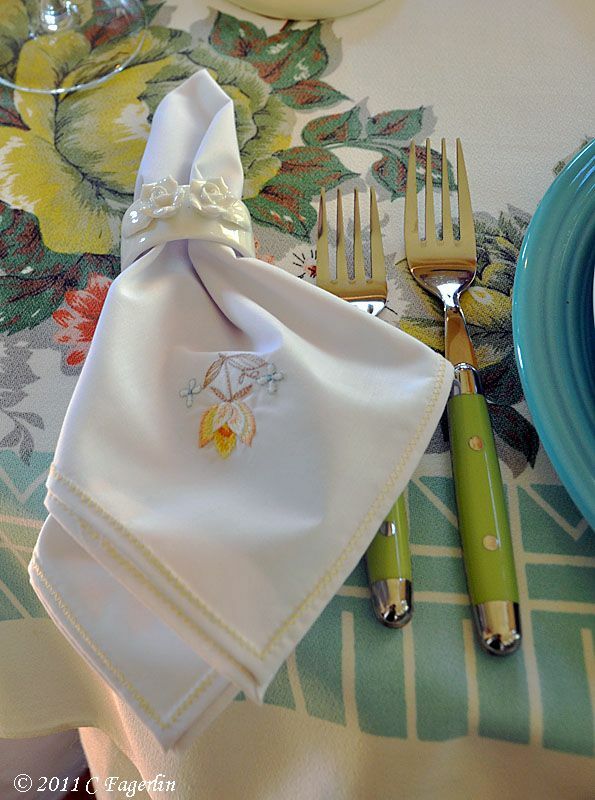 as always, you have beautiful table setting! 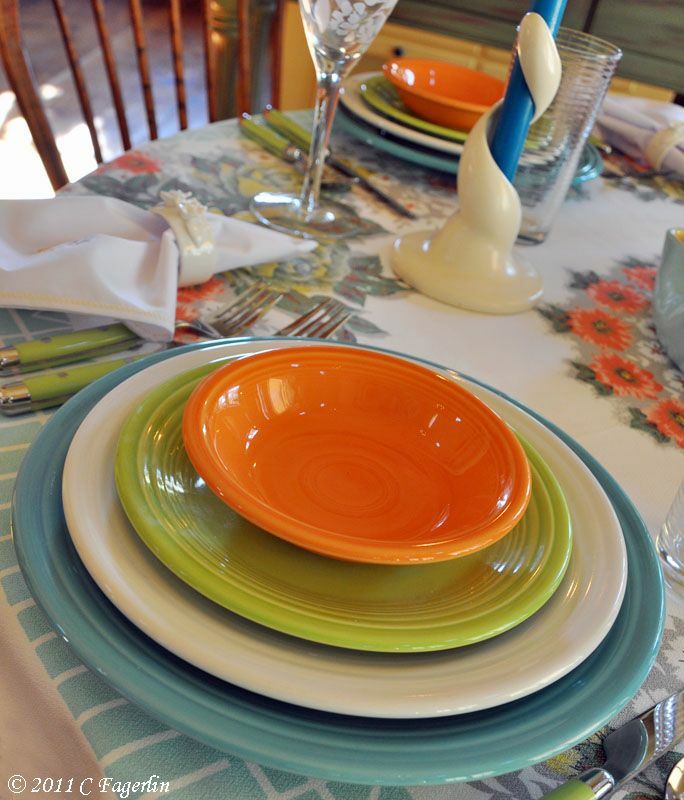 your china collection just beautiful! So many of us are ready for Spring, those of you in snow country probably have a harder time thinking Spring than I do. :-) The roses are already putting on new growth, but they need to take a rest already! If they start blooming too soon, the late Winter rain ruins the first flush of blooms. Again, thanks so very much for all your lovely comments ... it will just be a few more weeks and I'll be posting the first roses for 2011.